The key to a successful decontamination action is to have an accurate and complete analysis of the contamination on the location. MICCS speeds up the process and reduces costs of a complete site investigation. The main technical steps taken during the process are described below. Ground Penetrating Radar (GPR) and Groundtracer technology allows to efficiently and relatively quickly make a preliminary scan of the location. An antenna array is mounted on a wheeled frame. An operator drags the frame and carries a computer, which controls the transmitter and the receiver in the antenna array. The signals emitted by the GRP allow to scan the structure of the soil, determining the potential spots with high concentration of contaminants. MICCS software allows to plot the results of the scan, making a graphical presentation using Google Maps, shown to the right. GPR and GroundTracer from GroundTracer Systems and Support BV are used for the MICCS Demo project. An integral part of the contamination analysis is taking samples. Normally, this would involve the slow and expensive process of using a drill to make boreholes and collecting soil samples from them. These would then be sent to a specialised facility for a lengthy analysis. Besides the overall slow speed, many boreholes need to be made, as essentially the operator does not have real-time feedback and there is no immediate data, which would allow the operator to concentrate on a specific plot. MICCS revolutionises this process by integrating two cutting-endge technologies. One is a "sonic drill" - a technology used in the oil industry to speed up drilling. Its pulsating end significantly decreases the time it takes to make boreholes. The other is the sensor - a device that is integrated into the drilling mechanism and makes real-time readings. Using the MICCS contamination detection software in conjunction with the sensor allows to immediately detect the type and concentration of any contaminants in the soil. After the initial set-up, involving a quick positioning the drilling mechanism using the operators remote control, the sensor is fitted onto the drill. It is also attached to a local workstation, where the operator can monitor the readings. The video to the right shows the whole process at one of the pilot study locations. The most important stage of contamination characterisation is analysis of data from the boreholes. 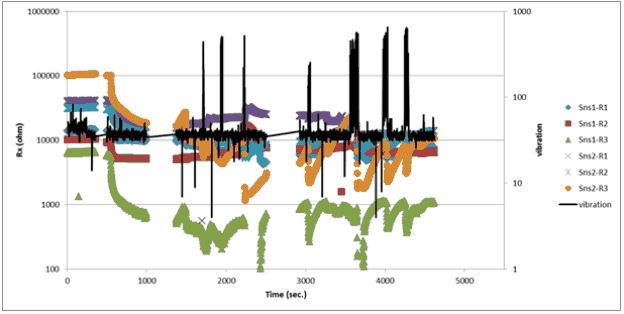 Image below displays a graphical example of data collected using the sensors. This data is used to determine the type and concentration of contamination at various depths in a particular borehole. The graph also shows the intensity of the sonic drilling process, depicted by the black curve.